In a recent study published in AJKD, Oberdhan et al (Open Access) discuss the development of a new health-related quality of life (HRQoL) tool for patients with Autosomal Dominant Polycystic Kidney Disease (ADPKD) patients. The name of the instrument is the ADPKD Impact Scale (ADPKD-IS). To my knowledge, this is the first HRQoL for patients with ADPKD. I have deep interest on this subject based on both my personal and family history with ADPKD. On the maternal side of my family, three generations have been affected by ADPKD. Before the common utilization of dialysis, my grandfather died of renal failure at age 59. Dialysis sustained my mother’s life for 4 ½ years, but she died prematurely at age 52. I was able to avoid dialysis by having a pre-emptive kidney transplant in 2004. The development of the ADPKD-IS clearly reflects patient-centered design principles. First, the Qualitative Development phase incorporated the patient voice in the conceptual development of a HRQoL. It was extended into the generation of items and content validity. Furthermore, patients were represented on a global basis. Development of the Autosomal Dominant Polycystic Kidney Disease Impact Scale (ADPKD-IS). Abbreviations: CKD, chronic kidney disease; PRO, patient-reported outcome. Figure 1 from Oberdhan et al, AJKD © National Kidney Foundation. 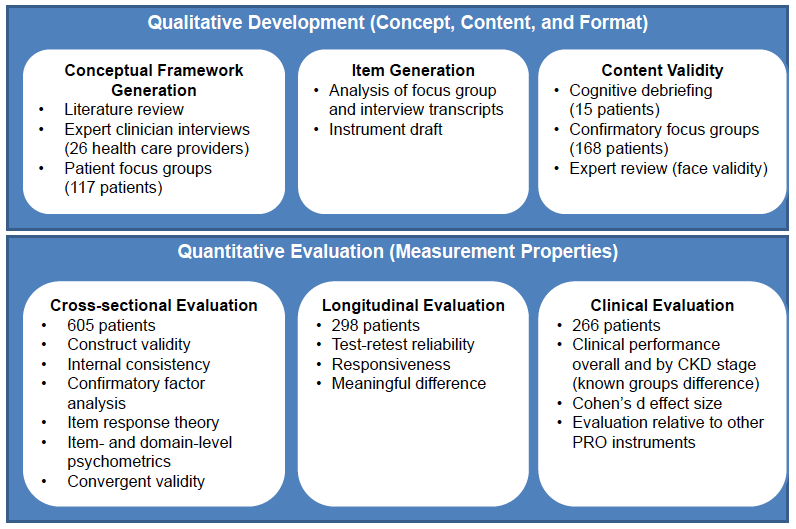 The patient-centered design principles were continued in the Quantitative Evaluation (measurement properties). The patient voice was captured richly in cross-sectional evaluation, longitudinal evaluation, and clinical evaluation. Oberdhan et al should be applauded for their patient-centered approach, which meets the definition created by the Institute of Medicine seminal report, “Crossing the Quality Chasm.” I can’t think of any higher praise for the investigators. Autosomal Dominant Polycystic Kidney Disease Impact Scale (ADPKD-IS) final conceptual framework and model. Figure 2 from Oberdhan et al, AJKD © National Kidney Foundation. These three domains match my personal experience completely. While pain and fatigue were very much present in my journey, the emotional domain was the most difficult and dominant, especially dealing with an unknown health future. As I went through my patient journey, these thoughts began to wear on me emotionally: When would I go into renal failure? Would I be able to avoid dialysis and find a living donor? If I found a donor, would the transplanted kidney work? ADPKD quality of patient care: The ADPKD-IS provides a possible clinical management tool to be used across the spectrum of ADPKD patient care. Currently, there is variance between how nephrologists with ADPKD expertise treat the disease versus nephrologists with limited ADPKD experience. The introduction of ADPKD-IS also creates the opportunity to track the spectrum of disease across different stages, and assess various intervention efforts based upon these stages. This could result in possible improved standards of care for patients with ADPKD. ADPKD patient-focused drug development: When Otsuka started developing tolvaptan for ADPKD in 2003, an HRQoL instrument was not available for patients with ADPKD. The lack of an ADPKD-specific instrument may partially explain why there are still no approved treatments for ADPKD in the US. The ADPKD-IS may now provide pharmaceutical companies a tool to guide ADPKD clinical trials. Strategically, this advancement supports the development of earlier treatment interventions for ADPKD clinical trials. HRQoL instruments for other kidney diseases: It is my desire that the ADPKD-IS will stimulate other kidney disease communities to take action. For example, an HRQoL measurement tool does not exist in IgA nephropathy. The development of a tool could not only improve the standardization of patient care, but it could also mitigate the pharmaceutical investment risk. The development of a HRQoL instrument provides patient insights into health domains that matter to patients. – Post prepared by Kevin J. Fowler, AJKDBlog Guest Contributor. Kevin is President of The Voice of the Patient, Inc., and Vice-Chair of the Patient Family Partnership Council in the Kidney Health Initiative. Follow him @gratefull080504. To view the article by Oberdhan et al (Open Access), please visit AJKD.org. Nice article. The introduction of this ADPKD Impact Scale seems like a great step and can change the way how patients with severe kidney diseases are treated.